Tender beef quick fry steaks. Sear both sides in a hot pan, grab a fresh baguette, a dollop of mustard and a few salad leaves and you’ve got lunch sorted. 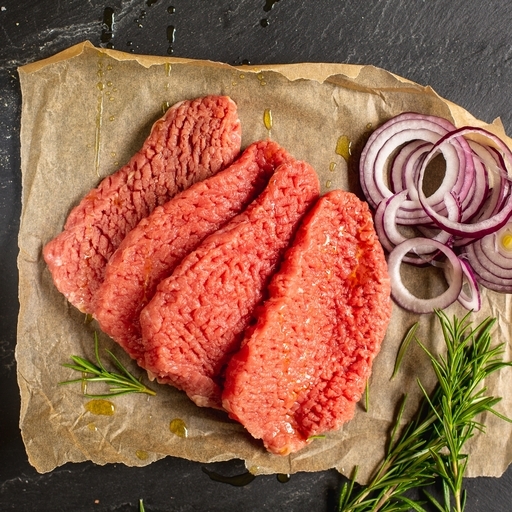 These juicy organic steaks are also ideal to sliver in stir-fries and Asian soups and broths. Approximately 4 beef quick fry steaks per pack. Try with one of Kirsty's delicious marinades here. Lean and very fast to cook; ideal for steak sandwiches and BBQs. Season well and fry over a high heat for 1-2 mins each side, until cooked through. They take well to being marinated first but will take a little longer to cook in the pan.